The T20 extravaganza in the Caribbean islands has finally come to an end after 34 matches. Trinbago Knight Riders (TKR) managed to defend the title by beating the Guyana Amazon Warriors (GAW) in the final in a one-sided game. Colin Munro was the hero with the bat for them as the credit should also go to the bowlers for restricting the opponents to a meagre total. However, the Knights’ ace spinner Sunil Narine was seen bowling with a different action in the game which surprised many. Narine hasn’t had the best of the seasons this year but the champion bowler delivered when it mattered for his team in the second qualifier. All the eyes were on him in the title clash and he fared decently by returning with the figures of 1/31 in his four overs. The only wicket which he scalped was of Sohail Tanvir who has the ability to hurt the opposition with his willow. Many were left perplexed with the way Sunil Narine bowled in the high-octane clash. 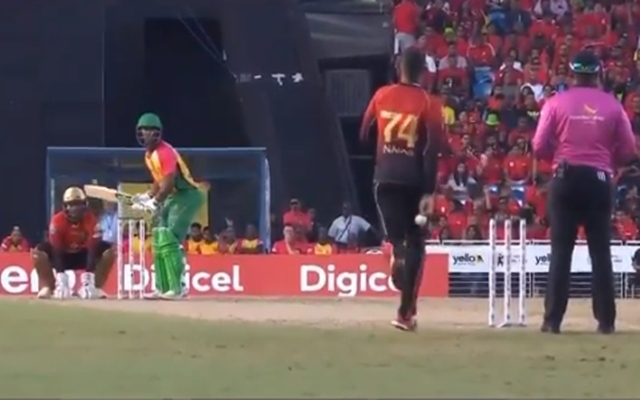 After being introduced into the attack, Narine hid the ball during his run-up and didn’t let the batsman know the variation he was trying to bowl. His bowling hand came in with a different angle than normally it comes. Now his new action didn’t put batsmen in much trouble and nor did it proved to be much of a suspense. So what was the reason to change the action at the eleventh hour which has worked for him so well over the years? Narine normally puts in a lot of effort on his shoulder and the ball is not delivered the way he did today in the final. It seems that his recent shoulder injury has forced him to do so. Reportedly, Narine has hurt his shoulder during the pre-game practice session and bowled with pain in the second qualifier. But the injury might have aggravated and has forced him to change his action in a way that it doesn’t affect his injured shoulder. He was in no discomfort with the ball though and it was a decent effort from the mystery spinner.